This is another article about OpenStack with Ceph as the storage backend. Like my other posts about this topic this is not about how to install and configure your private cloud but it’s more a collection of obstacles you could be facing. For me it’s also an online documentation in case I forgot what I did weeks, months or even years ago. Now let’s get to it. We’ve been working with Ceph for quite a while now, it’s really comfortable launching instances within seconds. But from time to time we noticed that some instances took several minutes to boot, and there was nothing obvious happening on the compute nodes or in the Ceph cluster. So we didn’t really bother to debug it further, it’s not too bad if you have to wait one minute or so for a 6 GB instance to start. What is that ‘_base’ file? Why is there a full image as a single file in the compute node’s filesystem? Why does nova import that full image back into Ceph instead of cloning it? One problem is that an imported image has no parent data, it is a flat (independent) RBD image so it takes up all the space instead of being a Copy-on-Write clone (CoW). This is not what we signed up for when using Ceph! And it’s also not what we are seeing most of the time, usually all of this works fine for us, so what is different with this image? Although it’s been always clear that it’s recommended to use raw images with Ceph it’s still possible to use other formats, such as qcow2 or iso. So when we uploaded ISO images into the cloud we set the flag --disk-format iso to be able to distinguish the image types, assuming this was just a display option and not something the nova code would actually process. Well, we were wrong. Ok, understood, I should only use raw images if I want to benefit from CoW clones. If the disk-format is “iso” this will result in a new file in /var/lib/nova/instances/_base/. The uploaded image doesn’t have the “disk-format” flag. Since I create the new image from volume Nova will eventually delete the ‘_base’ file of the ISO while new instances are created as CoW clones directly on RBD level. But for some reason – I could not reproduce this yet – sometimes when a new instance is launched the base image from Glance is downloaded to the compute node, serving as image cache for Nova leading to the above described behavior. So there’s still one question left: why did Nova download the base image to the compute node if it already was a raw image residing in Ceph? I have no answer yet, but I’ll update this post as soon as I have figured it out. The important lesson from this is: be aware of Nova requiring disk space if you intend to use non-raw formats with your Ceph backend, otherwise consider converting your qcow images to raw format and re-uploading them to Glance. If you’re wondering if it’s possible to simply change the disk-format for existing Glance images, the answer is (as usual) “it depends”. Attribute disk_format can be only replaced for a queued image. So this will only work while the image is queued and the upload has not started yet. If that manipulated image was a real ISO this will (probably) work and a newly spawned instance will be created as a rbd clone. Such a change can work for some other formats, too, but there’s no way to predict anything. Most certainly this won’t work for qcow2 images, you’ll either have to keep them and monitor the disk space on your compute nodes or you convert the respective images into raw format an re-upload them. I didn’t have other image formats at hand to test further, we basically only use qcow2, ISOs and raw images in our environment, so if you have further information for other formats feel free to comment. Now let’s put that “strange” behavior aside and focus on a different question. Which format is better for Glance, raw or qcow2? I’ll focus only on “raw” and “qcow2” since those are relevant for our environment and their difference may be significant regarding the effectiveness of thin-provisioning. Of course, there are different scenarios where one format succeeds over the other: on the one hand, a qcow image usually needs much less space in storage than a raw image. On the other hand, in an OpenStack environment this can neutralize the benefits of qcow if the base image has to be downloaded to the local filesystem. This results in longer boot processes for new instances, which then are flat and need more storage space than a CoW clone (assuming you mostly use ephemeral disks), and the base image also needs space on the compute node. A raw image needs more space in the Glance filestore, yes, but launching new instances only takes a few seconds and the Nova disk is a clone, so it requires no additional space at creation time (copy-on-write). Again, this only applies to ephemeral disks. If you usually have instances based on volumes this doesn’t apply to you. Volume based instances also take more time to boot because the image’s content is copied to the volume so it’s also a flat rbd image. So let’s take a closer look on the difference between qcow2 and raw. Notice the difference between the image size. Alright, the sizes are what we expected. But what about the real size of the rbd images? You didn’t expect that, did you! The command rbd diff $pool/$image provides the “difference since the beginning of time, so it reports all extents”, read this for more information. We see that Ceph’s own thin-provisioning of raw images works quite nice! You could even say that the advantages of qcow disappear (in this context) because there’s some additional metadata to be stored about which data blocks exist and which can be skipped. 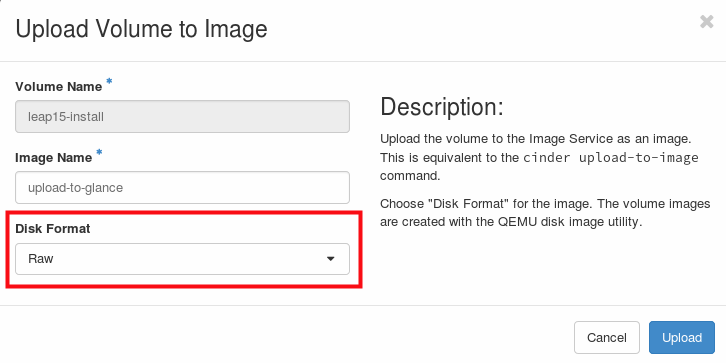 In conclusion this means that – again: it depends on your requirements – if possible choose raw over qcow2 images when working with OpenStack and Ceph. Although it’s still not possible to reproduce this in a reliable way I encountered the same incident. For some reason this was set to “qcow2” instead of the default “raw”, leading to the above described symptoms. That should prevent unintentional or wrong image uploads and keep the advantages of CoW clones. I finally found an answer to my question. I already knew that some kind of image caching seemed to be active, I just didn’t know where to look exactly, I had already searched for all kinds of things, including looking into the python code. But with some luck I found this answer. So the answer is pretty simple, disable image caching in nova by setting cache_images = none in nova.conf on all compute nodes and restart the nova-compute.service. This entry was posted in Ceph, OpenStack, SUSE Cloud, Virtualisation. Bookmark the permalink.